Performance driving and racing through the eyes of in-car video. Retired racer Riccardo Patrese takes his wife out on the track. There's quite the contrast between his calm controlled driving and her opposite-of-calm-and-controlled riding passenger. Heads up. This isn't suitable for work if you're office speaks Italian, or Spanish. Too bad we can't see what's going on outside the car though. There's a nice writeup about RaceDV's in-car video service in the latest issue of AutoSimSport magazine(June 2008). There a nice write up about our service, how the concept came to be, and how we worked with the good folks at Terrapoint to help produce the sim version of Calabogie Motorsport Park. There's also a very informative article on Terrapoints laser scanning technology and how it can be used to produce very detailed race tracks in simulators. The zip file of the pdf is here. I'm excited about this day. Today marks a first for RaceDV. We have officially partnered with the Castrol Canadian Touring Car Championship to become their official in-car video service provider. This means competitors in the series will be able to get our full season service at a pretty decent discount. I'm hoping we can help the championship build a solid fan base online through the community at racedv.com. Look for in-car videos of the action to start appearing soon. We'll be encouraging fans and drivers to get involved in the online community and bridge the gap from the grandstands to the track. Subscribe to this blog for some select highlights I'll be posting from the 2008 season. I'll be at the race this weekend in Shannonville. See the championship website for details. The latest updates to racedv.com just went live this weekend. With a new layout and a tweaked display engine, news and fresh videos are easier to find and watch. We've also added a new registration feature. This will allow you to sign up for your very own RaceDV video in advance of your event so you can make sure you have your spot reserved. We'll also be offering specials through this same registration system. The first events will be posted soon. Check often for upcoming events at Calabogie Motorsports Park and other tracks. Drop us a line if you're a club organizer and want to arrange a special for your group. We were out at Calabogie Motorsports Park last week and came across this. Poor bird. For the life of me, I still can't figure out how this bird ended up in that position. The RaceDV Lap Record Challenge at Calabogie Motorsports Park is over. It turned out to be great a success at the Canadian Motorsports Expo. Our leaderboard was completely full and we had to resort to bumping people off as the slowest times were beat. The challenge was to drive a Porsche Cup Car at Calabogie Motorsports Park and post the best lap time possible. Bruce Gregory, owner of the track, setup the game himself to closely match the real thing. He posted a 1:59.706, about 7 seconds quicker than a real cup car. That time stood on top for just about the whole weekend. It took the full three days for Bruce's time to get beat. RaceDV's own Tim Wong managed to put a time in good enough for fifth. 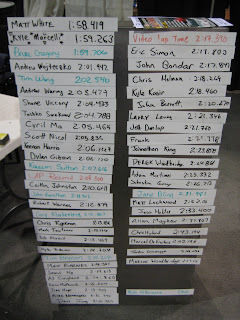 I guess it comes as no surprise that the top times were all set by race drivers. The two times that beat Bruce's were set by 2007 Ontario Formula Ford champions. Kyle Marcelli topped the board on Sunday afternoon and kept that spot for most of the day. It took Matt White a nerve wracking series of laps with a crowd gathered in anticipation of a new leader. It was no earlier than the final 5 minutes of the entire weekend that Matt posted the winning time to cheers from the crowd. Congratulations on the win Matt! We're looking forward to seeing you at Calabogie for your CMP Lapping Day with RaceDV's in-car video service. Thank you Kyle, for making it such a close contest. It was incredibly exciting for all. Congrats go out to all the top contenders. It wasn't an easy challenge to post good laps in such a short period of time. Thanks to everyone who came out and tried their hand at the challenge. We hope you enjoyed yourselves and got to know a little more about RaceDV and Calabogie Motorsports Park. If you didn't get a chance to come see us or have a chat, head on over to racedv.com to see some in-car video or our company site for more information about us. For more about the rest of the show, our friends over at CarZi wrote up a 2008 Canadian Motorsports Expo Review.